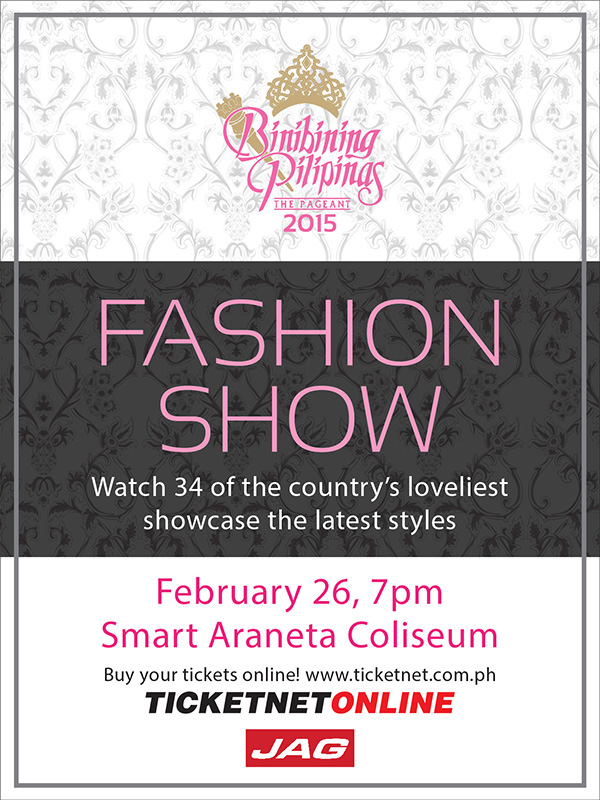 On February 26, 2015 at 7 PM, 34 of the loveliest Filipinas from all over the country will take center stage at the Binibining Pilipinas 2015 Fashion Show at the Smart Araneta Coliseum. This is a fashion extravaganza like no other! The eagerly awaited event is a visual feast, with Binibining Pilipinas candidates gracefully strutting their stuff on the runway, clad in JAG jeans and modern accessories. Hosted by Binibining Pilipinas reigning queens, the event also features special performances by the Filipino rock band, The Dawn. To purchase tickets, visit TicketNet Online or call 911-5555 for inquiries.